NSK Grease NS7has remarkable torque characteristics (low torque) and can be used wide temperature range. NSK GREASE LR 3 contains a special synthetic oil for high temperature and stability, and a careful y selected anti-based grease containing lithium thickener and several additives. This grease dramatical y increases lubrication life under high temperature conditions. Lubrication life exceeded 2 000 hours in the endurance test demonstrates superb capability in retaining water. Even containing a large amount of water, it does not at 150ºC. It is a standard grease for general NSK linear guides, ball screws and monocarriers. It is prevalently It is a standard grease for bal screws PSS type (shaft dia. 15 mm or over), FSS type and VFA type. It is ideal for operation with medium load, at high speed such as positioning in high tact material oxidization. NSK GREASE LG 2 grease was developed by NSK to be exclusively used for linear guides, ball screws and This is a proprietary urea grease of NSK featuring low dust emission exclusively for ball screws and Monocarriers in clean room. Compared to the fl uorine grease which are commonly used in clean linear guides which are used in clean rooms. LG2 has several advantages such as ;higher in lubrication function, longer lubrication life, more stable torque (resistant to wear) higher rust prevention. LG2 is a lubrication grease for rolling element products such as linear guides, ball screws and monocarriers for semiconductor and liquid crystal display (LCD) processing equipment which require a highly clean environment. Nsk Hand Grease Pump for all the bellow shaped Nsk Grease tubes. With detachable nozels. 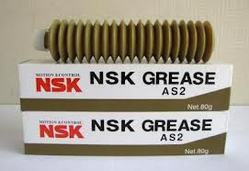 NSK GREASE PS 2 major base oil component is synthetic oil with mineral oil. It is an excellent lubrication especial y for It has remarkable anti-fretting corrosion property. It can be used in wide temperature range, from low Feature low temperature operation. It is for high speed and light load. 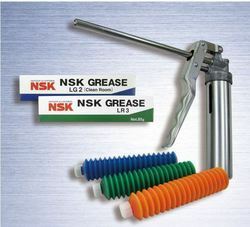 NSK Grease AS 2 standard grease for general NSK linear guides, ball screws and monocarriers. It is prevalently used in many applications because of its high base oil viscosity, high load resistance, and stability in oxidization. Grease AS 2 an environmentally friendly and widely used grease for high load application. It is mineral oil based grease containing lithium thickener and several additives. NSK Grease NSL anti-fretting property and superb torque characteristics (low torque) for high-speed operation. 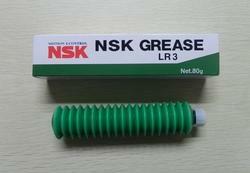 NSK Greases NF 2 suitable for ball screws and linear guides of which application include oscillating operations. It uses high-grade synthetic oil as the base oil and urea base organic compound as the thickener. It has remarkable anti-fretting corrosion property. It can be used in wide temperature range, from low to high, and has superior lubrication life. 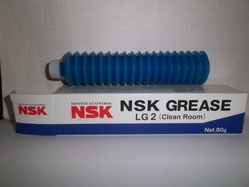 NSK Grease LGU exclusive lubrication grease for ball screws and linear guides that are installed in equipment that requires cleanliness, as same as LG2 grease, and it can be used in high temperature range. Wash the linear guide and ball screws to remove oil prior to applying Clean Grease LGU, so the grease functions are fully utilized. Clean grease is exclusively used for clean environments under normal pressure. This is a proprietary urea grease of NSK featuring low dust emission exclusively for ball screws and linear guides which are used in clean rooms. 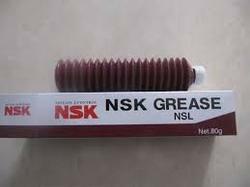 Looking for NSK Greases ?